JAMIE WHITE won praise from boss Dave Carter after making a flying start to life with his new club Moneyfields. The striker helped to preserve their unbeaten record in the Southern League east division with a goal on his debut. He wasted little time in making an impact, putting the league leaders ahead in only the fourth minute of their 1-1 draw at Cambridge City. The home side levelled on the half-hour as the top two could not be separated. 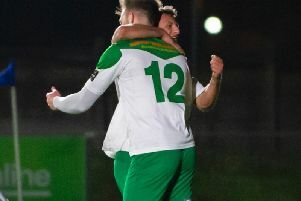 With both his first-choice strikers, Steve Hutchings and Ryan Pennery suspended, manager Dave Carter swooped to bring White in from Blackfield & Langley. Carter believes he will add another dimension to his squad. ‘He has scored goals wherever he has been,’ said the Moneys manager. ‘His goal came from a fantastic first touch and great left-footed strike from the edge of the area. White’s early goal was a result of a positive start from the visitors. Gary Austin also went close to extending the lead but was foiled by a good save from the home goalkeeper. City hit back to level the scores on the half hour. Moneyfields felt defender Sam Pearce was fouled at the far post before the ball was returned into the area for City to score. The second half saw the visitors defend superbly. ‘Our back four were fantastic in the second half,’ said Carter. ‘Cambridge play a very similar direct style to us but Sam Pearce, Curtis de Costa and Jamie Ford will mop that up all day long. ‘We have to be happy to come away from the team in second place with a point considering we are down to the barebones. ‘There were three 17 year olds on our bench and we lost Tyler Giddings to illness just before the kick off. Moneyfields play Uxbridge at Dover Road in the league on Tuesday (7.45pm).